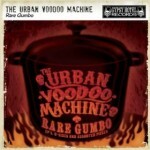 Share the post "Album review: THE URBAN VOODOO MACHINE – Rare Gumbo"
Even the most riotous and irreverent of bands sometimes need a break. And ‘Rare Gumbo’ is compilation album that gathers together The Urban Voodoo Machine’s bits and pieces in the form of EP tracks, B-sides, limited release tracks and a brace of bonus BBC sessions, to fill the gap before their next recording. You can imagine this 11 piece ensemble being a challenging night out. Main man and vocalist Paul-Ronney Angel is a restless Norwegian musical spirit who moved to London in the early 90’s and once plied his trade with high-energy band The Godfathers. The Urban Voodoo Machine is a multi-instrumental, fluid band who play everything from gypsy stomps to murder ballads and rock & roll with growled lyrics set to whip crack rhythms. The big band line-up includes guitar, fiddle, washboard, accordion, horns and all manner of percussion, all topped by Paul-Ronney Angel’s rusty bucket growl. Paul sees the band’s musical lineage as stretching from the early Stones to The Clash and The Pogues. He also helpfully calls the music ‘Bourbon Gypsy Blues Bop ‘n’ Stroll’, as the 20 plus tracks rarely settle in any one direction. There are plenty of pulsating rhythms, an occasional big screen vista and its adventurous music, played with an occasional sense of the ridiculous. Things start promisingly on the gypsy violin, guitar tremolo led, stomping instrumental ‘Last Dance Of The Silver Wolf’, before they slip into the percussive rockabilly of ‘Getting Hot Going Down’ which owes a lot to The Jim Jones Revue (unsurprisingly, Jones was a former band member). The band ride rough-shod over a bewildering variety of styles, from the Tom Waits growl and spaghetti western feel of ‘The Death Of Celestina Rose’ and the self explanatory, rockabilly tinged ‘You Got Me (By the Balls)’, to the bluesy garage rock of ‘Killer Sound’ and the tribal drums and a snaking synth line on ‘Recipe for Disaster’. And just when you think they’ve revealed their full hand, they pop up with the very dark ballad ‘Orphan’s Lament’. The surprising late night feel and evocative narrative of ‘Alone In The City’ also suggests there’s more to their musical palate than just a high-energy dance with the devil. Paul further vents his spleen on the rather obvious ‘Devil On A String’ and ‘Love Song 666’. He’s equally gruff on the big wall of sound of ‘Here Comes The Thunder’, and he adds a Beefheart vocal as the band search out plenty of swing and a sing-along chorus on ‘Plenty More Room’, before an imaginatively reworking of AC/DC’s ‘Hell’s Bells’ with their own bluesy voodoo. This entry was posted in ALBUM REVIEWS, ALBUM REVIEWS (Mobile), All Posts and tagged AC/DC, bourbon gypsy blues, Captain Beefheart, garage rock, gypsy stomps, murder ballads, Paul-Ronney Angel, Rare Gumbo, rock& roll, Rolling Stones, The Clash, The Godfathers, The Jim Jones Revue, The Pogues, The Urban Voodoo Machine. Bookmark the permalink.